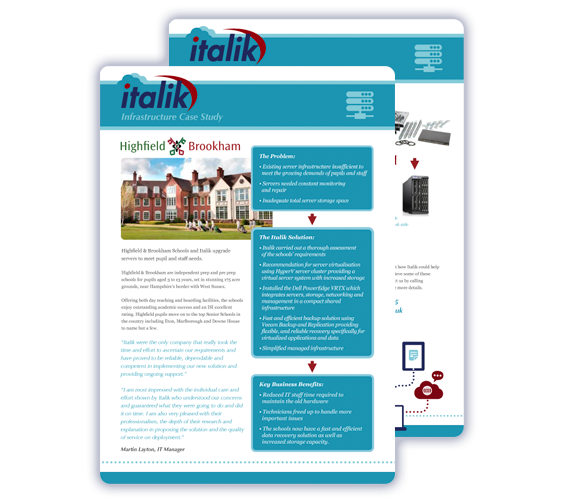 Italik were the only company that really took the time and effort to ascertain our requirements and have proved to be reliable, dependable and competent in implementing our new solution and providing ongoing support. I am most impressed with the individual care and effort shown by Italik who understood our concerns and guaranteed what they were going to do and did it on time. I am also very pleased with their professionalism, the depth of their research and explanation in proposing the solution and the quality of service on deployment. Our ability to work from day one in the new offices in Shifnal was business critical and the ability to access data on the corporate network was a prerequisite to this. This was complicated by a protracted refurbishment programme however Italik architected a solution that allowed us to locate people in temporary locations initially and then progressively built up an IT network system that developed with the refurbishment but also allowed people to continue working. Italik were fantastic and instrumental setting up our new office and relationship with our new client, which for me has been a huge success. Highfield & Brookham are independent prep and pre prep schools for pupils aged 3 to 13 years, set in stunning 175 acre grounds, near Hampshire’s border with West Sussex. Italik upgraded their servers to meet pupil and staff needs. Yorkshire Warrior is the ultimate physical challenge. The course consists of 10 and 5 tough miles across the Yorkshire countryside with hills, bogs, river walk, underground tunnel, fire, ice bath, barbed wire, electric fence, crawling, climbing plus lots more!